To create an invoice, click the blue New Invoice button on the right of the navigation bar. A client must be selected to create a new invoice. Either select a client from the list, or create a new one at the top of the page. After selecting or creating a client, your invoice has been created. At this point, it is only a draft and will appear under the "Drafts" section of the Dashboard if you need to return to it another time. Read about sending an invoice to make this invoice visible to your client. Beneath the invoice number you may optionally add a brief description of this invoice, such as "June Retainer" or "Q1 Design Work". This description will be visible throughout Slimvoice to help you distinguish multiple invoices assigned to the same client from one another. Your client will also see this on his or her copy of the invoice. An invoice starts with the "Issued" date set to the current date. An optional "Payment Due" date may be set beneath that in the top-right corner of the invoice. The "Payment Due" date currently has no effect on the function of Slimvoice; it is simply for record keeping and information for your client. Clicking on the client's name at the top of the invoice will allow you select a new client if you wish to reassign this invoice. In the center of the invoice are a list of line item expenses. You may add new line items by clicking the icon on the left. Each line item has four fields: a description, a quantity, a price, and a total. You may enter any text in the description field. When editing the quantity and price fields, the total will calculate automatically with the formula total = quantity × price. Editing the total field directly will set the quantity to 1 and the price to what you entered in the total field. Negative numbers may be used in the price and total fields to create a discount. To rearrange line items, simply hover a line item with your cursor, and then click and drag the three bars on the left edge of the line item. Drop it at the new desired location. To delete a line item, hover it with your cursor and then click the red × on its right edge. Tax may be applied to an invoice by checking the box beneath the subtotal and entering a tax percentage. The description field is optional: your description will be displayed if entered (e.g. "Sales Tax"), otherwise "Tax" will be displayed. Any additional notes you would like to leave to your client may be entered at the bottom of the invoice. To save your changes, don't forget to click the blue Save Changes button. Clicking the gray Cancel button will reset your invoice to how it appeared when you loaded the page. To change an invoice number, first make sure that it is marked as a draft (if not, click the blue Edit button at the bottom). Then simply click on the large blue invoice number at the top to change it. Keep in mind that no two invoices on your account may share the same number. To send an invoice, click the blue Send button at the bottom of the draft. A dialog will appear asking to which email addresses you would like to send the invoice (if you haven't added any email addresses or would like to add more, go to the Clients page and add them). A log of email addresses to which the invoice has been sent is kept beneath the invoice on the left. This log will indicate delivery successes and failures, as well as if the recipient has opened the email. If you would simply like to mark the invoice as sent rather than actually sending out emails, you can click the blue Mark as Sent button. Once an invoice has been marked as sent, it will no longer be considered a draft and its contents cannot be edited. To revert this change, simply click the blue Edit button that has appeared in place of the Send button. The status of the emails will be displayed beneath the invoice. A blue &check; will be displayed if the delivery was successful, and a red × will be displayed if it could not be delivered. An additional &check; will appear when the recipient has opened the email. Click the blue Preview button to get a preview of what the recipient will see (in addition to the PDF). Sharing this link with anyone will allow them to see the invoice and, if you have a payment account connected, make a payment. Keep in mind that only you can see this while you're logged in and if the invoice is not marked as sent. The Dashboard shows a graph of the most recent 24 months of invoices. This is your overview to compare performance month-to-month. Beside that is the total amount invoiced year-to-date (Jan. 1 until now) and the last 12 months. Keep in mind that these are just the invoice totals, regardless of whether your client has paid or not! Scroll down to the unpaid section of the dashboard to see which invoices have outstanding balances. Going to the entire Invoices list will show you all invoices that you have ever created. The gray Filter button to the right will allow you to filter and view a subset of all invoices. Navigating to a particular client's page under the Clients interface will allow you to do the same while limiting the scope to that particular client. You can keep track of payments received from your client by navigating to an invoice and then adding them with the icon on the right side beneath the invoice. This will help you keep track of outstanding payments on the Dashboard. To accept card payments directly on your invoices, go to Settings and scroll down to the Payments section. 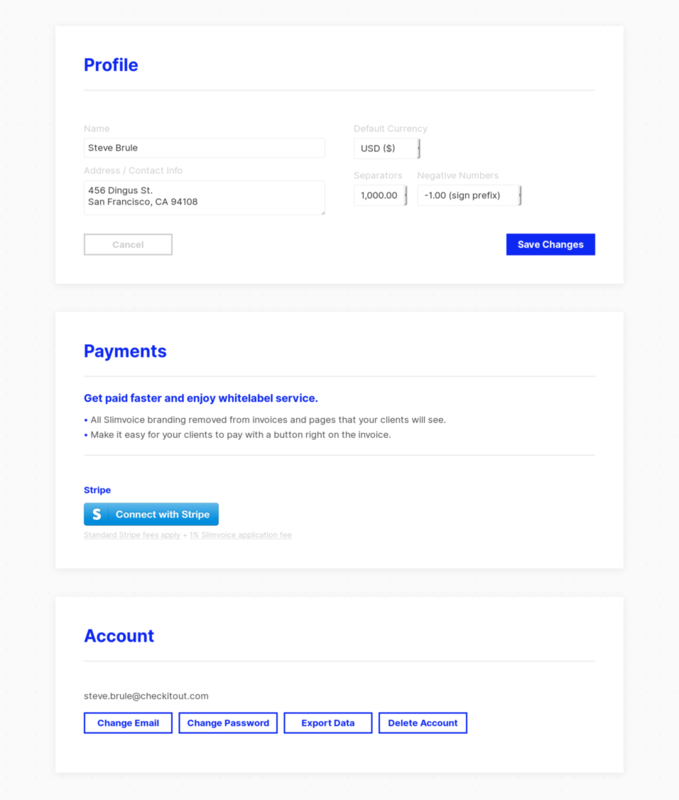 There you will be able to connect a Stripe account. 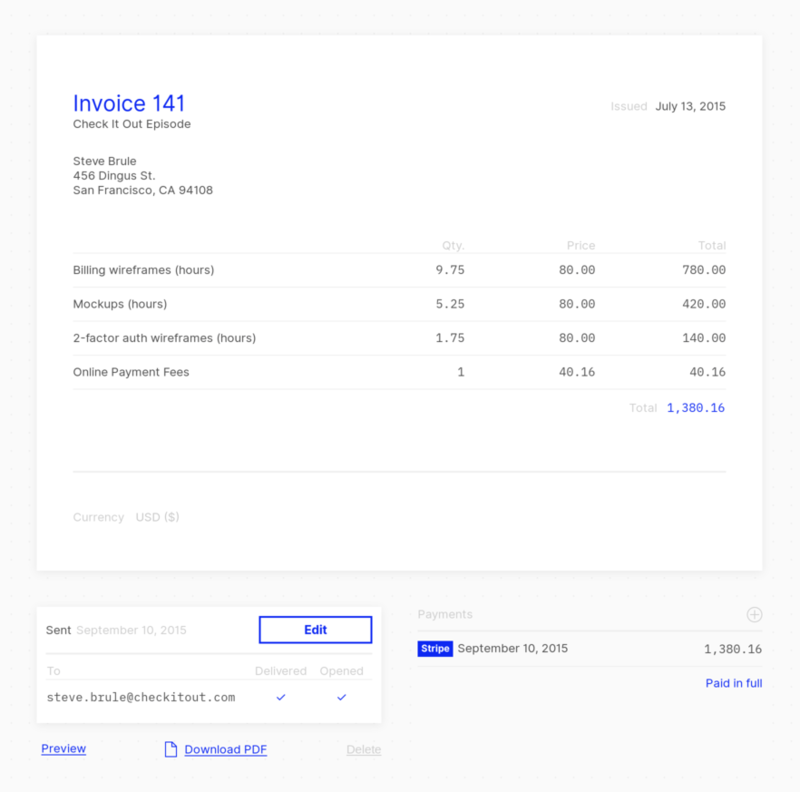 Once you have connected a Stripe account, all invoices will have a button placed at the bottom where your client can pay via card (disconnecting your Stripe account will disable this feature). When a client makes a payment via card, the transaction will be recorded in the Payments log automatically. When accepting a card payment, the amount charged to the card will be the balance of what is due, so any payments you have entered manually will be subtracted from the total when calculating the charge to the card. You may use Slimvoice to generate an invoice and send it for free. If you and your client settle up via cash, check, or any other method that you please, there is no obligation to pay. The 1% application fee is what enables Slimvoice to be otherwise available for free. Slimvoice is a labor of love: if you enjoy using Slimvoice, please consider accepting card payments or referring a friend who would accept card payments. The Slimvoice link will be removed from the bottom of every PDF page. The Slimvoice logo and link will be removed from the email sent to your clients. The Slimvoice logo and link will be removed from the bottom of the webpage where your client can make a payment. The Slimvoice logo and navigation bar will be removed from the top of the webpage where your client can make a payment. The sender of the invoice email appears as your name rather than Slimvoice. If you disconnect your Stripe account, the whitelabel feature will be disabled. Additional methods for customizing this will be added in the future. New invoices will be created with your default currency, specified in Settings. Each invoice can have its currency customized by choosing one from the dropdown at the bottom left corner of a draft. It doesn't make sense to add US Dollars to Mexican Pesos, so anywhere in the app that shows a list of invoices or drafts with multiple currencies will total each currency separately. Hovering over the total will indicate the currency of each invoice. The historical graph at the top of the dashboard page shows only data for your default currency. Deleting your account is permanent. All of your data will be completely erased and there will be no trace that you were ever here; this does not simply "deactivate" your account. If you are sure that you want to delete your account, go to Settings and click the blue Delete Account button at the bottom and enter your password. This action is immediate, permanent, and unrecoverable, so export your data first if there is anything you would like to keep. If you have feedback or would like to suggest a feature, please submit it here.